Most of the Pacific seafloor was not affected by the Shock Dynamics event, and there are features on it that point to an extraordinary past. 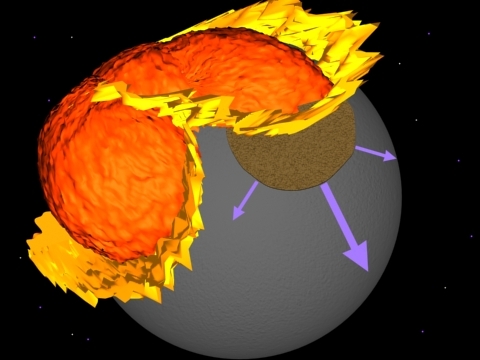 Using the assumptions and evidence upon which the Shock Dynamics theory is based plus current ideas about the formation of the Moon, it is possible to piece together events prior to the Shock Dynamics event. The Earth began with a uniform basaltic crust, typical of oceanic crust. 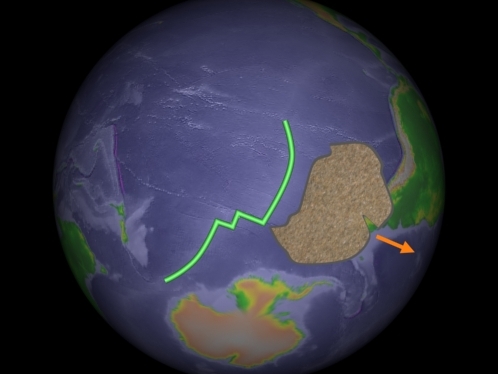 A moderately large impact struck the Earth near where Japan is today. The melting and mixing of basaltic crust and upper mantle differentiated into continental crust in the impact area, which I will call Antar. The collision of a Mars-size planetesimal ejected material that coalesced to form the Moon, according to current mainstream thinking. In this reconstruction, I speculate that the impact also struck the northern portion of Antar, splitting it and sending the pieces skimming across the basaltic crust. The pulling away of the largest piece, which became East Antarctica, left behind an extension (or peninsula) that became Alaska and the Chukchi Peninsula following the Shock Dynamics impact (see Alaska view). 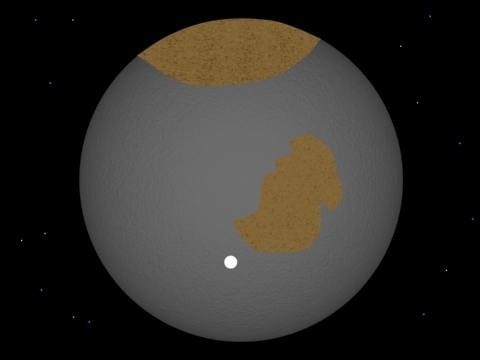 The collision likely gave Earth its 23.45 degree tilt. It also produced a magma ocean that released gases contained in the Earth's mantle, mainly water vapor, carbon dioxide, and nitrogen. These formed a thick atmosphere encompassing the Earth, and an ocean of water. 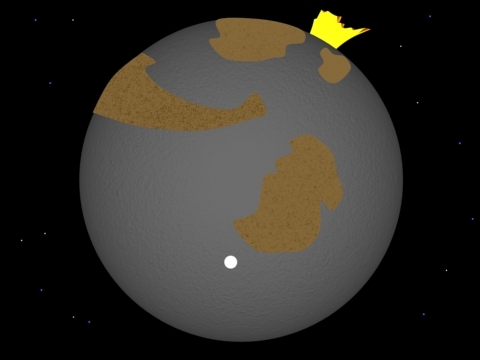 As with the first impact, the melting and mixing of basaltic crust and upper mantle differentiated into continental crust in the large area hit by the planetesimal, becoming the protocontinent. Over time, granitic continental crust on the surface broke down into sand and fine silt, which accumulated on and offshore of the continental crust. The largest piece of Antar (East Antarctica) came to rest near the South Pole (white dot). Eventually a meteorite swarm pelted Earth, collapsing the atmosphere along with its concentration of water vapor, causing a global flood. That is discussed in presentation 30. 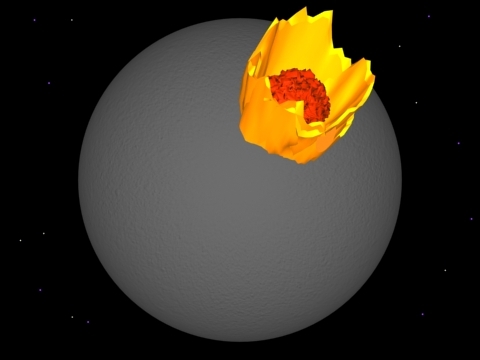 When, later, the Shock Dynamics meteorite struck the Earth, South America rushed away from Africa. On its southern end was an extended arm that had been wrapped around what is today South Africa, reaching all the way to Madagascar. 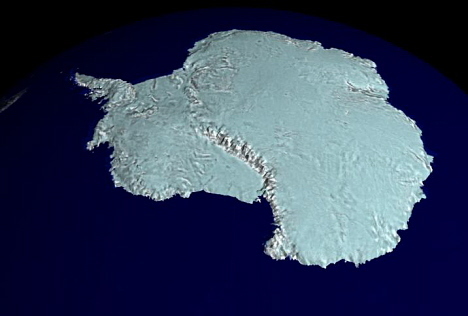 The extended arm collided with East Antarctica, turning and pushing it in the direction of South America's movement. The arm pulled off of South America, and the two ends dragged to make the Scotia/Sandwich Trench/Ridges (purple). 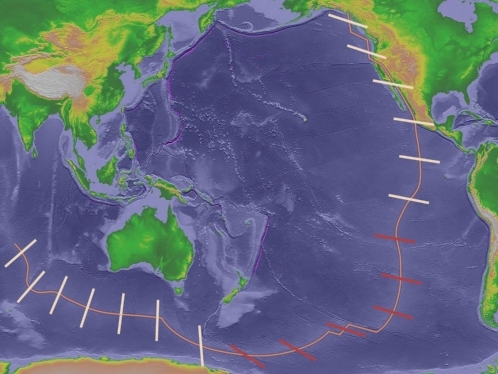 Initial motion of East Antarctica opened the oceanic crust under its former leading edge. The outpouring of flood basalts became the Kerguelen Plateau. The high cliffs that run along the left edge of East Antarctica in the image below are an unusual mountain range. 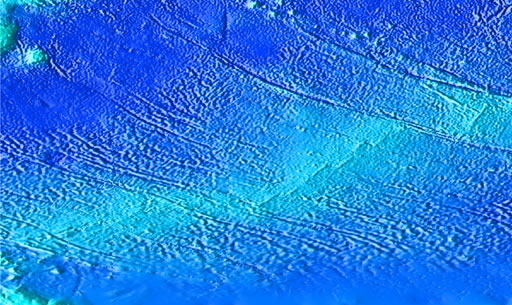 These Transantarctic Mountains were not formed by lateral compression but by curling up.14 It suggests that East Antarctica was formerly part of a larger whole that was clipped along the line of the mountains, as proposed in this scenario. Also, the big difference in thickness between West (25 km) and East (40 km) Antarctica12, clearly apparent in this image, suggests that they did not originate together but were brought together. 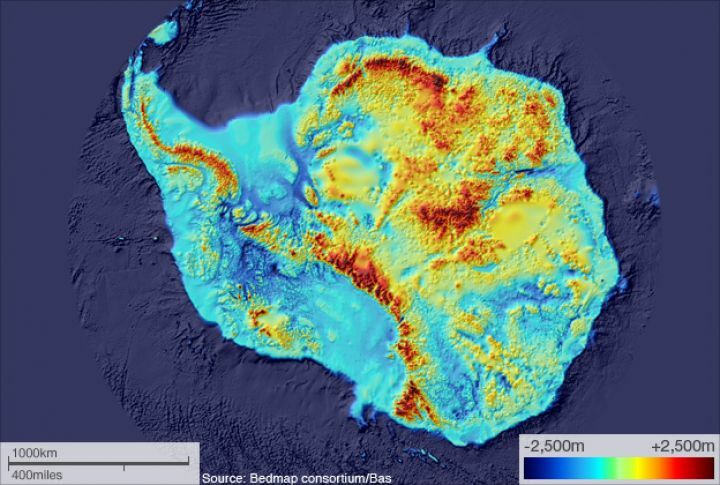 At the center of East Antarctica are the Gamburtsev Subglacial Mountains (GSM). In a study using seismic tomography, "no evidence is found for a significant thermal anomaly beneath the GSM, precluding the existence of a Cenozoic hotspot". The data "indicate little change in lithospheric thickness beneath the GSM and surrounding regions." In the opinion of the researchers, "uplift is attributed to one or more Proterozoic compressional orogenic events". "For example, the Petermann Range in central Australia represents the remnants of a... compressional intraplate orogeny".4 In other words, a strong compressive force in ancient times raised the mountains in central Antarctica, similar to what happened to Australia. Presentation 6 shows how the Shock Dynamics meteorite impact formed the Petermann Range and the Bight in Australia. In the same way, the impact of the planetesimal on Antar formed the Gamburtsev Subglacial Mountains. A giant impact could melt a significant part of one hemisphere of the Earth, but even the largest impact is unlikely to melt the Earth completely. 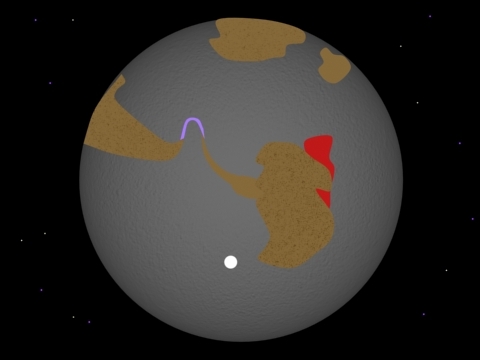 Simulations suggest that the melted region would have a radius of about half the radius of the Earth. The temperature increase in the remaining part of the Earth is due to the shock wave. It decays very rapidly with distance from the molten region so that the opposite side of the Earth is heated very little. Convection is extremely turbulent and is driven by cooling at the surface. The convective velocity of the magma ocean is estimated to be up to 40 meters per second. Crystallization starts from the bottom, and in less than 1000 years propagates through the lower mantle toward the surface. As the zone of 60% crystallization reaches the surface, the driving force for this type of convection disappears and it stops, leaving the mantle below undifferentiated. Differentiation occurs mainly in the remaining shallow magma ocean. The shallow magma ocean is the only part of the mantle that undergoes any substantial differentiation. There is a hot melt zone at the top of the mantle called the asthenosphere. Currently there is no explanation for its presence, so it is interesting to consider that it might be the final cooling of a magma ocean. 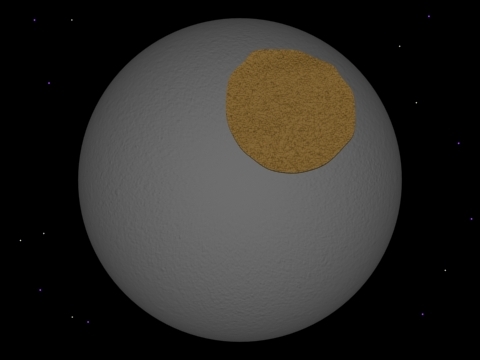 But the important point is that the giant impact would melt and thoroughly mix oceanic basalt crust with material in the shallow magma ocean, concentrating incompatible elements into refined continental crust at the surface. "Variscan magmatic rocks are widespread in Northern Xinjiang [China]. More importantly, these Variscan magmatic rocks were derived from the same source. It has been well established that the average composition of continental crust is granodioritic, whereas the crust of Northern Xinjiang was oceanic. How was the oceanic/basic crust converted into a felsic one?" "It is possible that these Variscan magmatic rocks originated from the partial melting of the remnant oceanic crust, but the heat source has not yet been determined." In the Shock Dynamics theory, features on the face of the Earth are primarily made by action on the surface. That applies to the spreading ridges that encompass the Earth like the seam of a baseball. When continental crust divides and moves over oceanic crust, the top of the oceanic crust melts and follows the moving continental crust in the manner demonstrated with parafin wax experiments. The most well-known of these was published in 1972, and is described below. From reference 7, page 301. The Atlantic ridge is an example of slow spreading. The Pacific is an example of fast spreading. "Mantle melting beneath ocean ridges is caused by decompression as mantle adiabatically upwells". "More melt is produced from a given parcel of mantle beneath fast-spreading ridges than beneath slow-spreading ridges." "Spreading rate variation is the primary variable that determines both the extent of mantle melting beneath ocean ridges and mid-ocean ridge basalt chemistry. "6 This seems odd, considering that the difference in speeds is between 2.5 and 11 centimeters per year.6 And yet "all these types of ridges produce crust of 6-7 km thickness, except for those with extremely low half-spreading rates (less than 0.5 cm per year), where it is thinner"11 such as in the Arctic. Geologists talk about oceanic crust in 3 layers. Layer 1 is fairly thin sediment. The upper part of Layer 2 (called 2A) is 0.5 km-thick basaltic lava in the form of 'pillow basalt' (fine-crystal or glassy basalt that cooled quickly). The lower part (called 2B) is 1.5 km-thick diabase (medium-size crystal basalt that cooled more slowly) intrusive dikes (fairly vertical sheets of solidified magma). Layer 3 is 4-5 km-thick gabbro (coarse crystal basalt that cooled slowly). The evidence of tiny or non-existent magma chambers under spreading ridges that encompass the world suggests that spreading ridges are the remains of past events, things that formed long ago and are not great seams of upwelling today. As weak zones in the oceanic crust, they are subject to stress from differential rotation between the lithosphere and mantle, as well as from other forces, producing limited volcanism and earthquakes. In the Shock Dynamics paradigm, the speed of Antar was considerably faster, because of the greater force-to-mass ratio, than that of continents separating after the Shock Dynamics impact. This produced the distinct "fast spreading" ridge with extremely long transform faults and higher melt volume. But since both events were limited to altering the surface of the oceanic crust, Layer 3 was undisturbed and the magma supply to dikes was universally small for both, being surface melt from pressure and pressure-relief melting. The ridge reaching from the East Pacific Rise to the Southeast Indian Rise is illustrated below. The bars show the directions that transform faults extend from the ridge, and thus the trend of spreading. 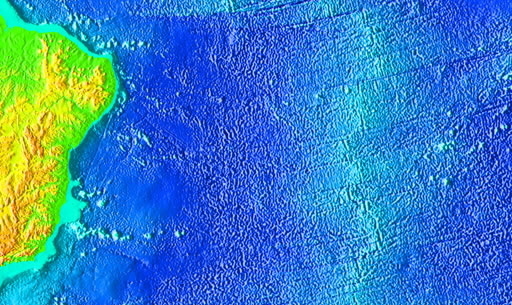 Following this scenario, the white bars indicate parts of the ridge where side strips of Antar passed over the seafloor. Those that went east are now accreted (attached by collision) to the west coast of North America. Those that went south are now accreted to South America. This material would have ended up west of Africa. Accretion to North and South America would have occurred as these landmasses moved west following the Shock Dynamics impact, accumulating the material like bugs on a car grill. A strip of this material on North America's west coast, from Vancouver Island to Baja California, appears to have slid north a few hundred miles with North America's slight counterclockwise rotation. The red bars mark the likely path of the largest part of Antar, which became East Antarctica. These sections of the ridge are by far the most dramatic in the world for length and definition of transform faults, and are associated with so-called megatrends of seamount chains and fracture zones. Two prominent megatrends are shown in yellow below. There are many thousands of seamounts on the Pacific seafloor. Crudely speaking, they are pimples where hot magma has pushed to the surface. 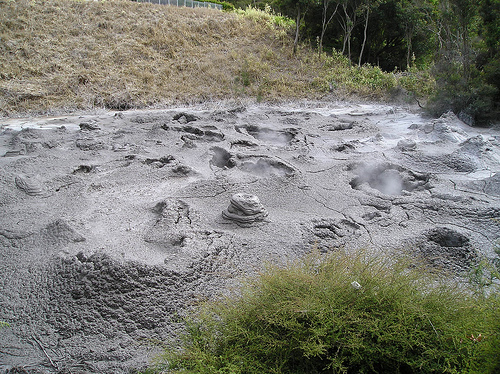 On a small scale, one can compare them to bubbles of boiling mud above hot springs. 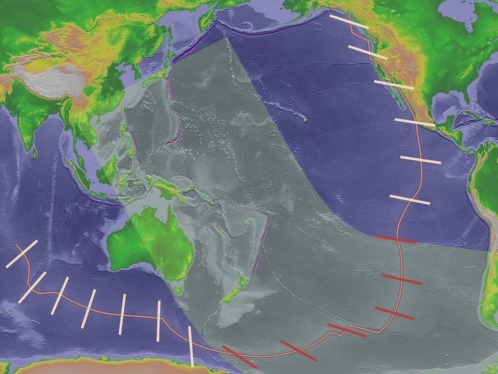 Following this scenario, the portion of the Pacific seafloor nearest to the impact of the planetesimal was heated the most, producing the most seamounts. The largest piece of Antar (East Antarctica) pulled a film of hot surface seafloor crust behind it, so seamounts should follow its path in diminishing numbers. 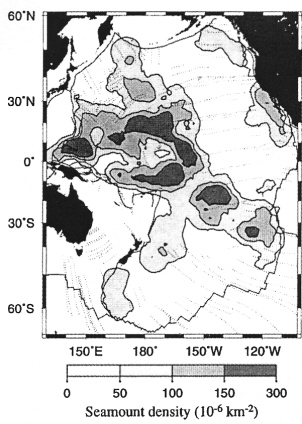 The map (below) of seamount density15 on the Pacific plate shows that to be so, with a northwest-southeast axis. Together, these features suggest a path for East Antarctica represented by the shaded area below. 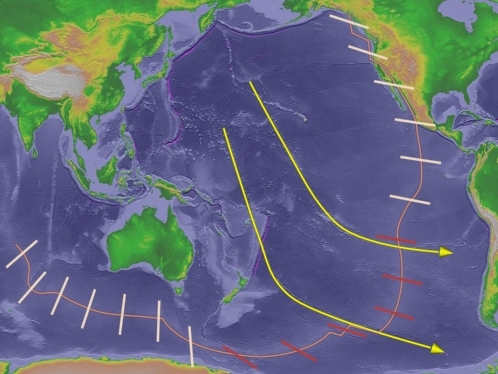 Note that the Shock Dynamics event happened much later, and thrust new landmasses and features into the western part of the shaded area, such as the Izu-Bonin and Marianas Trenches, Japan, parts of Asia and Southeast Asia, Australia, New Zealand, the Tonga-Kermadec Trench, etc. The Emperor-Hawaiian chain is also associated with the Shock Dynamics event, in particular the movement of Alaska along the line of the Aleutian Trench. East Antarctica (Antar) fits the bulge in the East Pacific Rise nicely, as shown below. It is plausible that the force of impact of the planetesimal was sufficient to tip the Earth 23.5 degrees from the plane of the ecliptic. Because this was the same impact that set Antar in motion, the sudden tipping may have led to the bend in Antar's path. 1. Detrick, Robert S., John C. Mutter, Peter Buhl, Isaac I. Kim. 6 September 1990. No evidence from multichannel reflection data for a crustal magma chamber in the MARK area on the Mid-Atlantic Ridge. Nature, Vol. 347, pp. 61-64. 2. Forsyth, D.W., and the MELT Seismic Team. 22 May 1998. Imaging the Deep Seismic Structure Beneath a Mid-Ocean Ridge: The MELT Experiment. Science, Vol. 280, pp. 1215-1218. 3. Lebedev, Sergei, Rob D. van der Hilst. 2008. Global upper-mantle tomography with the automated multimode inversion of surface and S-wave forms. Geophysical Journal International, Vol. 173, pp. 505-518. 4. Lloyd, Andrew J., Andrew A. Nyblade, Douglas A. Wiens, Patrick J. Shore, Samantha E. Hansen, Masaki Kanao, Dapeng Zhao. 2013. Upper mantle seismic structure beneath central East Antarctica from body wave tomography: Implications for the origin of the Gamburtsev Subglacial Mountains. Geochemistry, Geophysics, Geosystems, Vol. 14, pp. 1-19, doi: 10.1002/ggge.20098, ISSN: 1525-2027. 5. Mutter, John C., Jeffrey A. Karson. 31 July 1992. Structural Processes at Slow-Spreading Ridges. Science, Vol. 257, pp. 627-634. 6. Niu, Yaoling, Roger Hekinian. 23 January 1997. 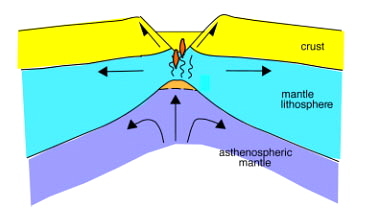 Spreading-rate dependence of the extent of mantle melting beneath ocean ridges. Nature, Vol. 385, pp. 326-329. 7. Oldenburg, Douglas W., James N. Brune. 20 October 1972. 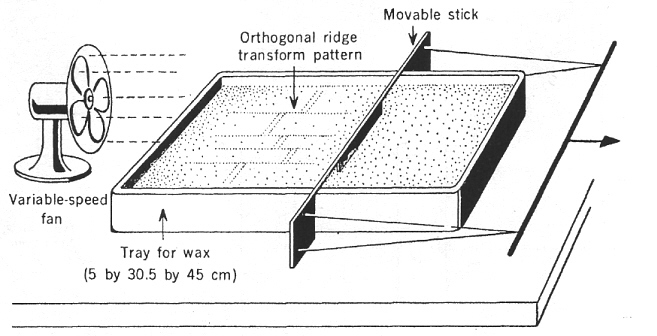 Ridge Transform Fault Spreading Pattern in Freezing Wax. Science, Vol. 178, No. 4058, pp. 301-304. 8. Peirce, Christine, Martin Sinha, Simon Topping, Christopher Gill. 2007. Morphology and genesis of slow-spreading ridges--seabed scattering and seismic imaging within the oceanic crust. Geophysical Journal International, Vol. 168, pp. 59-89. 9. Qin, Ran, W. Roger Buck. 2008. Why meter-wide dikes at oceanic spreading centers? Earth and Planetary Science Letters, Vol. 265, pp. 466-474. 10. Ragnarsson, Rolf, J. Lewis Ford, Christian D. Santangelo, Eberhard Bodenschatz. 29 April 1996. Rifts in Spreading Wax Layers. Physical Review Letters, Vol. 76, No. 18, pp. 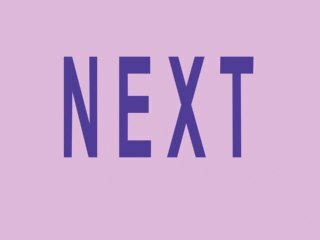 3456-3459. 11. Ruedas, Thomas, Harro Schmeling. 2008. Kinematic models for the thickness of oceanic crust at and near mid-oceanic spreading centers. Journal of Geophysical Research, Vol. 113, B01402, 21 pages. 12. Sieminski, Anne, Eric Debayle, Jean-Jacques Leveque. 2003. Seismic evidence for deep low-velocity anomalies in the transition zone beneath West Antarctica. Earth and Planetary Science Letters, Vol. 216, pp. 645-661. 13. Solomatov, V.S. 2000. Fluid dynamics of a terrestrial magma ocean, in Origin of the Earth and Moon, R. Canup and K. Righter (editors), University of Arizona Press, Tucson, Arizona, pp. 323-328. 14. ten Brink, Uri S., Ron I. Hackney, Stephen Bannister, Tim A. Stern, Yizhaq Makovsky. December 10, 1997. Uplift of the Transantarctic Mountains and the bedrock beneath the East Antarctic ice sheet. Journal of Geophysical Research, Vol. 102, No. B12, pp. 27,603-27,621. 15. Wessel, Paul, Suzanne Lyons. October 10, 1997. Distribution of large Pacific seamounts from Geosat/ERS-1: Implications for the history of intraplate volcanism. Journal of Geophysical Research, Vol. 102, No. B10, pp. 22,459-22,475. 16. Wilcock, William S.D., Sean C. Solomon, G.M. Purdy, Douglas R. Toomey. 27 November 1992. The Seismic Attenuation Structure of a Fast-Spreading Mid-Ocean Ridge. Science, Vol. 258, pp. 1470-1474.